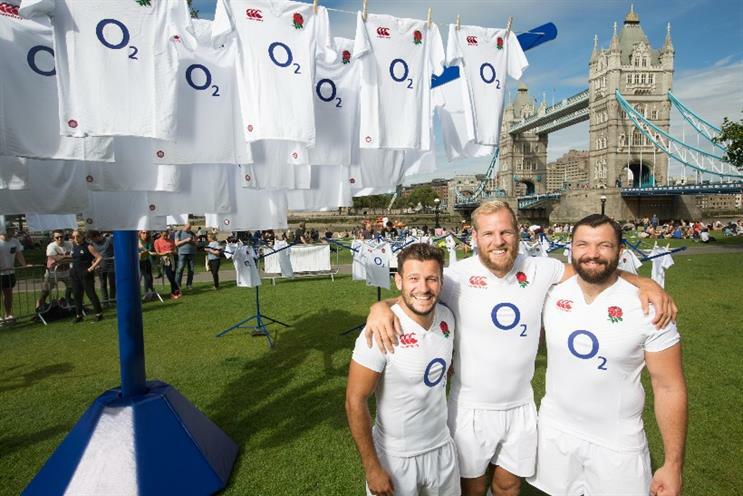 O2 will hang up 50,000 England Rugby shirts on giant washing lines around the UK this week, as part of its 'Wear the Rose' campaign ahead of the Rugby World Cup. The operator has put up the washing lines around various British cities at three metres high – the height of an average rugby line-out. Fans who demonstrate teamwork by forming a rugby line-up can win one of the shirts. The washing lines are up in Bath, Manchester, Leicester, and Newcastle. O2 customers using the operator’s rewards app, Priority, can also enter a prize draw to win a shirt by tweeting a message of support for the England Rugby team under #WeartheRose. As part of its ongoing ‘Wear the Rose’ tour around the UK, O2 is also offering 10,000 England Rugby shirts via iBeacon. O2 Priority customers will receive an SMS notification when a tour arrives, and can tap the location to claim their shirt. The idea behind ‘Wear the Rose’ is to build up support for the national team, ahead of the UK hosting the Rugby World Cup next month. O2 CEO Ronan Dunne said: "We’re calling upon the country to get behind the England Rugby Team, and how better to do that than wear the symbol sewn onto the chest of every England shirt – the red rose. "Whether it’s by working together to get a shirt fresh off the line or showing your support via social media, we’re challenging all of our customers to help make Stuart Lancaster’s England Team feel like giants."